SPOILER ALERT: this post contains references to the ending of the film. 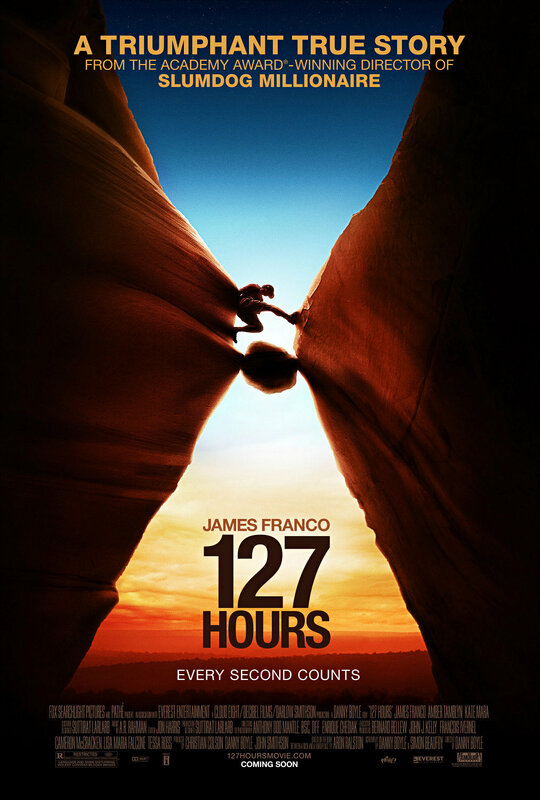 A true story about a chap who literally gets stuck between a rock and a hard place for 127 hours sounds like a pretty boring premise for a film, doesn’t it? But, perhaps because the film was directed by one of the UK’s best directors, and perhaps because the survivor of this ordeal was far more practical and down-to-earth than your average American, this is a brilliant story. Its protagonist, Aron Ralston, could well have been turned into a sickly sweet caricature, but Boyle’s deft use of his hallucinations, memory, premonitions, or whatever you want to call them, are handled in a way that firmly grounds him in the reality of his circumstance. The film doesn’t try to pretend that Aron never gave up hope, and it is his constant prevarications between hopelessness and persistence at the only option available to him that makes him both real and truly inspirational. There have been some ridiculous stories about people finding the blood and gore too much. My suspicion is that these folk must have been completely shielded from any exposure to blood in their entire existence to be so extremely squeamish. There is nothing particularly extreme about the depiction of the removal of Aron’s forearm, you might just need a strong armrest to grab hold of at a few critical moments. Limelight Cinemas’ hardware held up fine! Free Rain really are gracing the stage of The Q at the moment with their production of Oklahoma! The classic musical has certainly been in good hands under the direction of Anne Somes and musical direction of Leisa Keen, and the energy on opening night was simply infectious. Despite being a musical, and a light one at that, there is some genuine depth to these characters. Jenna Roberts’ portrayal of the heroine is particularly noteworthy, but they all sit in the shadow of Tony Falla, Amy Dunham and Mathew Chardon O’Dea who shine in the love triangle. Despite being given very little to work with by the writers, they have developed an engaging story that really moves along. I was particularly impressed with the cast’s American accents. Perhaps for the first time in Canberra, a local cast has successfully emulated a single American accent, rather than the more common practice of each cast member using an accent from a different part of the United States. It may not have been a perfect Oklahoma accent, but even the cast of the 1955 film didn’t manage that! There is something unfortunate in the fact that, when they wrote Oklahoma, Rodgers and Hammerstein didn’t see the value in the pioneering story that underlies the central love story. It leaves the love story a little hollow, and turns references to Oklahoma’s journey to statehood into quaint oddities. I think that with more focus on this aspect, the story would resonate much more deeply, and the central love story would be enhanced by a heightened sense of purpose and destiny. In all, this production of Oklahoma!is certainly one of the better musical productions of recent years. I may again have to eat my words. I’ve often lamented that the advent of remade films in the last decade signifies the death of creativity. Doing something ‘again’ is for the theatre; films can simply be played again, so there’s no point, and you should put your energy into making new ones. Well, now Joel and Ethan Coen have done it, and it is yet another remake of a film that I think is entirely worthy of the treatment. What’s worse is that having enjoyed this film so much, I may now have to watch a few Westerns to find out whether this really is one. True Grit was first made in 1969. 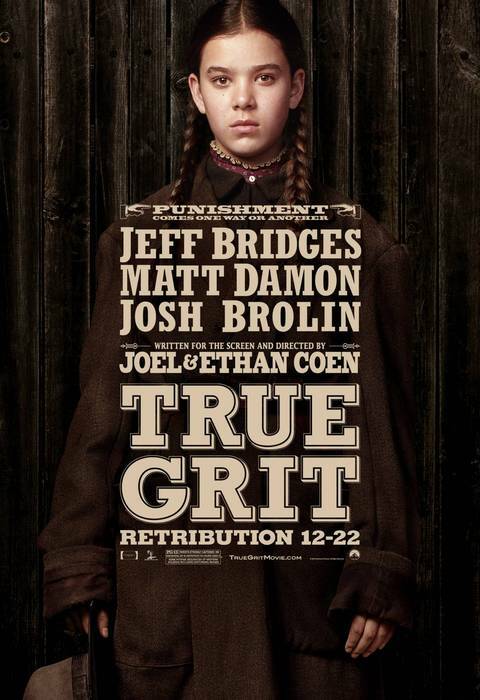 It is the story of a fourteen year old girl who seeks to revenge for her father’s murder and goes looking for a man of ‘true grit’ to undertake the fearsome task. She finds the same in Sheriff ‘Rooster’ Cogburn, a disreputable man with a drinking problem and a dislike for the one other person who cares about seeing the murderer hang. And so begins a journey into the Arkansas wilderness, and the wilderness of human emotions. Firmly ensconced within the Coens’ aesthetic oeuvre, this film is something really special. Despite being weighed down by overly loquacious and rather pretentious dialogue (which I think may be the norm for Westerns), the story hums along with engaging characters and a beautiful vision of Winter in the old west. Rather than soaking in a puddle of sentimentality, though, it explores the complexity of human emotions in the wake of life-changing events. In this, it diverges from what I had thought Westerns were all about. I understood them to be simplified and over-emotional excuses for a bit of gun-slinging; True Grit is nothing of the sort. I may just have to watch a few to see if I need to rethink my assumptions! An ageing Matt Damon is an excellent foil for an old Jeff Bridges, but neither hold a candle to Hailee Steinfeld who gives a commanding performance as the ineffable Mattie Ross seeking vengeance for her father’s death. The casting and execution of this role was surely critical to the success of this film, and Steinfeld really carries both the plot and the substance of the story. Now, I’ve hardly seen any Westerns in my time, and have never been a fan of the genre (not that I’m a fan of any genre per se), so I can’t comment on whether this is a reinvigoration of a tired genre of film-making, but it certainly is a fine piece of cinematography. It is, perhaps, the best film I’ve seen from the Coen Brothers, and that is really something.